I paid $0.1 for this record. Man, 90's, you didn't mess around. This "alternative" gem really bridged the gap between the 80's hair metal scourge and the breakout of punk into the mainstream. Breathy vocals, fuzzy guitars, and call/response chorus... pretty much all the tricks The Goo Goo Dolls use, actually. 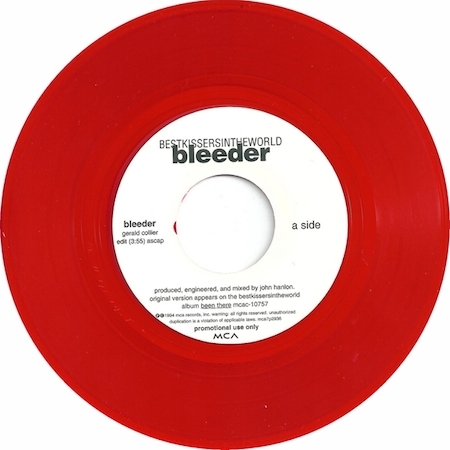 The title track of this promo by Best Kissers In The World is 1990's radio-ready with all the angst of using the word "bleed" in the chorus and getting sort of angry while brushing your long hair out of your face. Half-time pre-choruses hint back to that foundation of pyrotechnics and cocaine-fueled arena rock, but they're anchored by a strained and palm-muted post-chorus. So misunderstood! The real show-stealer of this record is a fuzzy, fast and fun jam on the B-side. "Ohio" is sort of a Rick Springfield throwback that is almost punk. The chorus refrain of "stole a car in Ohio" is a powerful hook when sung by a chorus of dudes. The real power lies in one of my favorite vocal tricks: hanging the edge of a phrase off the end of the bar and just dragging it out over an accompaniment part that has left it behind. I can't find the lyrics, but it sounds a bit like "see that boy never looked sooooooooooo...". It's pretty good. The only bad thing is the big arena rock ending. They finish off the B-side with a cover of Tommy Roe's "Sweet Pea", in a snotty sort-of-punk fashion. There are hints of nicety in it though, like the rebel boy you tried to scare your parents with but they saw through him and invited him over for dinner. They try to punk out the ending but fall back to the big arena rock ending again. I remember why I picked up this single at the KZSC record purge! I watched Bombshelter Videos and 120 minutes pretty religiously back in the day and saw this video (which is pretty stellar). I forgot that this band was local, as well, though I never saw them. Though my college radio station ditched them, I bet they got some good rotation on the Seattle alternative station.